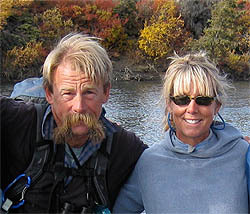 Wilderness Alaska was founded by Bob Waldrop and Deb Vogt in 1972. Back then the Brooks Range was a huge blank spot on the map and their original outings felt a lot like a Lewis and Clark experience as much as a modern retreat. I was first introduced to Wilderness Alaska in 1978, when I went to work for Bob and Deb. Returning to the University of Colorado to pursue a natural science degree during the winter and continuing to guide trips in the summer, the relationship continued until I replaced Deb as a partner in 1982. In those years I also worked with the National Audubon Society and the Point Reyes Bird Observatory. In 1986, Bob bowed out, leaving me the Wilderness Alaska tiller. Bob was a remarkable explorer and made a profound impression upon me. His confidence never wavered and his quest for new country was rarely daunted by untrod trails or unknown passes. Even after a long day of hauling a huge backpack, he would still call up enough energy to summit a nearby hill or scout a future trail dragging along someone to share treasures he would find. I have devoted every summer since as the principal guide continuing to unfurl this magical arctic curtain in the same way as my mentor Bob. My goal is to share the insights I have acquired from many years of experience, develop your wilderness skills and confidence as a traveler and to provide the same intoxicating experience that captivated me my first summer. All of the guides we select to help us are local Alaskans with years of safe sensible travel in the backcountry and a lust for the unspoiled country. In 1991, I had the tremendous good fortune of having DD Van Vliet join me and assume a number of tasks that often got overlooked during a busy field season, as an advisor and an assistant on a few trips each year. DD also devotes a great deal of energy looking for new and delicious culinary ideas raising the our standard well above the notion that food is just fuel. I can confidently say that you will be pleasantly surprised by the menu on any of our trips. While on trips she has the tremendous ability of seeing everything with the same enthusiasm as though it were the first time. We have helped people enjoy the Brooks Range longer than any other guiding operation without mishap or compromise of adventure. We will gladly supply references. Whether you select a kayaking trip in Prince William Sound or a more remote outing in the Arctic, we feel confident that your experience will be wholly satisfying and may open a door that has you returning to learn and experience more wonders of Alaska's last frontier. The warmth of the midnight sun awaits, and we look forward to you joining us this summer. Hope to hear from you soon. We have been written about in National Audubon, Alaska Magazine, National Geographic, Travel and Leisure, Outside Magazine, Gourmet Magazine, many national newspapers, including the Los Angeles Times, Seattle Times and New York Times and selected by several Alaskan guidebooks including the Lonely Planet and Alaska's Best Places. "Macgill Adams' goal is to see and visit all of the Arctic National Wildlife Refuge; his guided treks, therefore, are not limited to 'the same old routes'. Each trip offers some portion that is unique as well as open for opportunity. The Refuge's great glory lies in the ability to observe wildlife in undisturbed settings. Adams, ably assisted by DD Van Vliet, works hard to ensure that Arctic novice learn to appreciate not only the smack-in-the-face beauty of the Brooks Range but also the glorious subtleties of the plain and coastal lagoons." "Opening day," beams backcountry guide Macgill Adams, breathing in reverently, reaching out with open hands to embrace the wild Arctic. This is the beginning of his 14th summer in these parts. Macgill is the real McCoy, master of the genre. He is a naturalist, storyteller,adventurer and chef and he carries 100 pound loads. He has a significant reputation, which in Alaska is not easy to earn or maintain. He has raced the Iditarod, been a Brooks Range guideas long as almost anyone. His wilderness philosophy is elegant, fierce, and fun loving: "We can controll nothing, but we will handle everytrhing. The Arctic demands only that we have the right attitude..."
"Macgill Adams was our chief guide: 40 with a big bushy mustache, clear blue eyes, blond, tall and all sinew. He speaks with the lilt of a California beach boy and has a sense of humor: He takes a ribbing as well as he gives it. He is a keen observer who knows the wildflowers and birds and animals by name and habits. He also figured us out pretty quickly, by watching and listening, and ran the trip in a way that accommadated our peculiarities but kept us in balance with the overall agenda, the weather, where we were and what we needed to do to have a successful experience. He is a careful man who mailed us all a sheaf of information before the trip, outlining in great detail the particulars of the trip." "Macgill Adams, owner and pincipal guide for Wilderness Alaska, sent thorough pre-trip information, and his office was very helpful during my planning process. He offers a number of fascinating itineries in the Refuge, as well as the Gates of the Arctic and in Prince William Sound. I heard Macgill referred to as Mr. Refuge by a longtime Alaska resident and adventurer. At one with his environment, Macgill reminds me of a cross between a cantankerous mountain man and a laidback surfer dude. I had complete confidence in his guiding skills, we were served up camp food the likes of which I never dreamed could emerge from those crushed food bags, and I appreciated his extensive knowledge of the natural environment." "I never imagined Alaska could be like this!" "What a gift to spend quality time in Alaska's premier wilderness area with a leader who embodies the spirit of naturalist John Muir; the energy and stamina of wilderness hiker Bob Marshall; Olaus Murie's understanding of and passion for preserving the Arctic National Wildlife Refuge; the culinary skills of Wolfgang Puck; and the wit and humor of Robin Williams." "Old fashion border crossing in the last frontier"
"The Arctic in early June can't be beat. The bugs are down, the birds are getting active, photosynthesis factories are pumping away on the tundra floor and Macgill's coffee cake and pizza pie makes it all seem so unreal. And then on one fog laden day you just might come across twenty-six, cuter-than-puppy-golden-retriever caribou calves prancing across a snow patch with mom's in tow as a wolf howls in the distance." "Alaska is a hairy place!" "One of my friends went to Texas for the summer and thought it was big. When I told him that Alaska was twice as big as Texas, he asked me if I got lost in 'the last frontier'. I responded, 'No way. I was with my Uncle Macgill of Wilderness Alaska'." - Sam Garry, age 11 Fort Collins, CO.
"Kongakut, river of countless ridge walks"
"Among Macgill's most stellar qualities, he maintains an uncompromised respect for the Arctic environment, he possesses and knows how to share his thorough flora & fauna knowledge base and he serves delicious and varied meals in the wild (including the best freshly baked pizza north of the Yukon River)." - Tom Krebsbach, Pewaukee, WI. "Experiencing the coastal plain wilderness of the Arctic National Wildlife Refuge is as much about sounds as sights. The song of Lapland longspurs drifting across the open tundra. A band of caribou so close you can hear the animals breathing. Wind from an on-coming storm that may bring rain or snow. Moments of perfect silence that allow you to realize such a thing can still exist." "I got to go on my first kayaking trip this summer. We tidepooled in the morning, kayaked and explored glaciers in the afternoon and searched for voles in the evening. I had so much fun that by the third day, I couldn't get out of bed. I can't wait til the next trip."